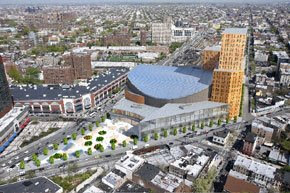 Why, as I write today, is the Empire State Development Corporation (ESDC) preparing to approve the Atlantic Yards plan in early September without having renderings of the arena (but having Design Guidelines), without having the New York Police Department examine security, without having an updated fiscal impact analysis (not to mention a real cost-benefit anlaysis), and without even clearing up how high the buildings would be? Well, the timing is all driven by the needs not of the public but of developer Forest City Ratner. Remember, the answer by Metropolitan Transportation Authority (MTA) CFO Gary Dellaverson, when asked in June why the MTA board had less than 48 hours to examine a revised deal for the Vanderbilt Yard. "I think that, in terms of why must it be now in the summer versus in the fall, I think that really relates to Forest City's desire to market their bonds as a tax-exempt issuance [by a December 31 deadline]," Dellaverson replied. "If the structure... is not such that allows for the marketability of the bonds, then the financial aspect of the transaction, as it relates to arena construction expenses that Forest City Ratner would incur, become less viable and perhaps not viable. That's not something that I'm prepared to say from my own knowledge... but I would be remiss if I suggested anything other--that's the principal driver of the timing." Meanwhile, in the absence of any official renderings, the Municipal Art Society (MAS) has produced a new rendering of the project, as shown in the New York Post, with no Building 1 office tower nor Urban Room but instead interim open space, plus one tower. The ESDC last month acknowledged that “prolonged adverse economic conditions” could slow all buildings after the arena--scheduled for first quarter of 2012--and just one tower. MAS also has produced a list comparing projected "public benefits" between 2006 and 2009. Keep in mind that the identity of the architects is not a public benefit--and, allegedly, Frank Gehry's master plan is still in force--and that in both 2006 and 2009 the ESDC merely "anticipated" a timetable rather than guaranteed it. The difference now is that the ESDC more readily acknowledges the potential for a delayed buildout. After all, former ESDC CEO Marisa Lago said the project could take decades--even though it officially is supposed to take just ten years to build. "The rendering reveals the dramatic differences between the new design for the Atlantic Yards arena and what was approved in 2006, and it highlights why the state must reevaluate the new project and its environmental impact," said Vin Cipolla, President of the Municipal Art Society. No such reevaluation is planned; the main purpose of the hearing over Wednesday and Thursday is to accept comments on the revised financial terms, including a new deal with the Metropolitan Transportation Authority and a delayed acquisition of the project site via eminent domain.